Independent Verkhovna Rada member Yevhen Murayev, who has recently left Vadym Rabinovych's Za Zhyttia (For Life) party, will now head the Nashi Party (Ours). "Not great, but important piece of news: we've held a congress with delegates from regional organizations of the party. From now on I officially head the "Nashi" party, which is registered with the Justice Ministry of Ukraine and has already begun its increase," he wrote on his Facebook page on Tuesday. 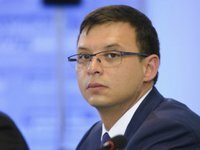 Murayev said the new party would announce its program in the near future.